Researches find alchemical bacteria that creates gold! The gold you see in the photo above was not found in a river or a mine. It was produced by a bacteria that, according to researchers at Michigan State University, can survive in extreme toxic environments and create 24-karat gold nuggets. Pure gold. Maybe this critter can save us all from the global economic crisis? Of course not—but at least it can make Kazem Kashefi—assistant professor of microbiology and molecular genetics—and Adam Brown—associate professor of electronic art and intermedia—a bit rich, if only for the show they have put together. Kashefi and Brown are the ones who have created this compact laboratory that uses the bacteria Cupriavidus metallidurans to turn gold chlroride—a toxic chemical liquid you can find in nature—into 99.9% pure gold. The bacteria is incredibly resistant to this toxic element. In fact, it’s 25 times stronger than previously thought. The researchers’ compact factory—which they named The Great Work of the Metal Lover—holds the bacteria as they feed it the gold chloride. 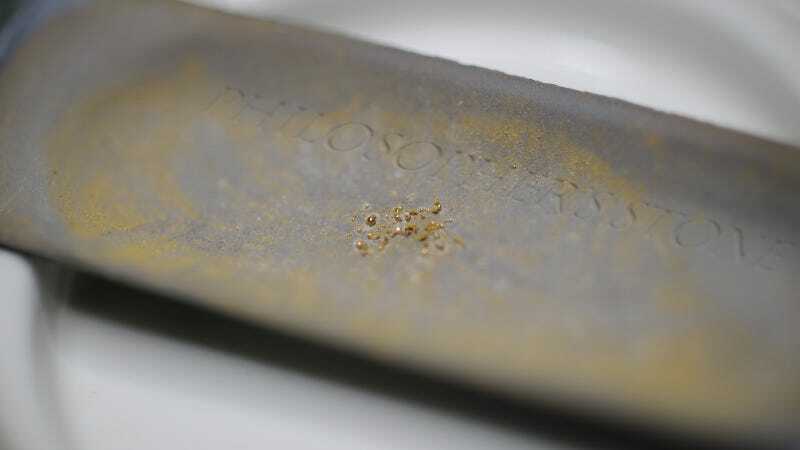 In about a week, the bacteria does its job, processing all that junk into the precious metal—a process they believe happens regularly in nature. So yes, basically, Cupriavidus metallidurans can eat toxins and poop out gold nuggets. The gold laboratory created by Kashefi and Brown. It contains the bacteria and the toxic crap they feed it. This is Cupriavidus metallidurans in action, eating away the toxins and producing the gold.